If you’re a regular reader of this site, you’re probably aware of Skype for iPad which made its way to the App Store yesterday. While rather full-featured, many users might be wondering how to record calls using this service, since no specific tool for this purpose is currently available. It turns out it’s rather simple, even obvious. Curious? Read on. Step 1: Launch Skype and start the desired call like you normally would. 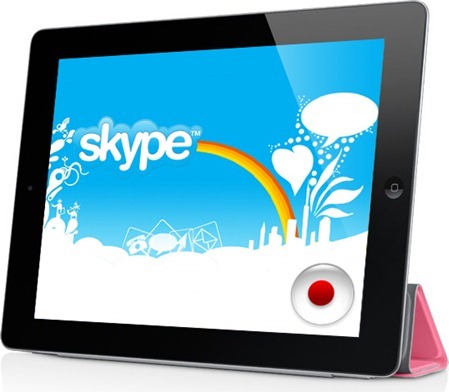 Step 2: Switch away from Skype, launch your recorder and start recording. Keep in mind that nothing will be recorded before this point. If you wish, you can begin recording first and only start recording afterwards, there really isn’t any difference. As you might have realized by now, this method is incredibly primitive since it simply uses your device’s built-in microphone and speaker to capture what’s going on, there’s no actual Skype integration involved. While this should work as expected if you’re using your device’s built-in speakers, it won’t function if your headphones are plugged in, since nothing will be played back using the external speaker and therefore the iPad’s microphone won’t be able to capture it. Once you’re done, you can connect your iPad to your computer in order to export the audio file you’ve just recorded, as long as it’s under 5 MB in size. New methods will surely surface soon, but for a 1-day old app, this is the best it can get. This goes without saying that you’re not yet able to record video calls, only audio. If you’re looking to tape an audio podcast on the go, however, this might be the best solution for quite some time. The Skype for iPad app, which supports video calls over Wi-Fi, among other features, is available for free from the iOS App Store.